Numark has a long tradition of developing innovative technology into wide variety of DJ gear including CD players, turntables mass media players and hardware controllers for DJ software. But we know that there are a lot of DJs who like to use what they know. That’s why we continue to refine and improve gear like the TTX USB turntable and the CDN88 MP3 CD player. Meet a new piece of gear that integrates all of these technologies into a single system that works the way you do, simplifies your setup and empowers you to perform in ways you may never have thought possible. If you’re a CD DJ looking for a new rig, MIXDECK was designed for you. If you’re thinking about working in your iPod, MIXDECK was designed for you. If you’re interested in being able to play from a USB drive, MIXDECK is for you. If you aren’t ready to give up your external inputs and ability to take CD-direct outputs to external gear, MIXDECK has you covered. And if you’re thinking about mixing in software, well MIXDECK is perfect for you. MIXDECK is a dual CD player with built-in mixer. And it has an iPod or iPhone dock, USB inputs, external I/O, and a USB-MIDI computer connection. But what’s important is that at its core, MIXDECK is a familiar, traditional dual CD player/mixer combo, just like our CDMIX units. MIXDECK works standalone as a CD player, and you can add on all kinds of different sources and playback media. You can use it in whatever way you like to perform. That’s why we call it the Universal DJ System. It’s the rig that lets you play your way. MIXDECK works with all kinds of media. It plays CDs, MP3-CDs, and even timecode CDs. If you’re at an event and somebody comes up to you with an iPod, asking you play their song, with MIXDECK, you can do it. Or, if you want to record your set and listen back afterward, you can do it with MIXDECK and your iPod or iPhone. If you have a USB flash or hard drive you want to use, you can do it with MIXDECK and never carry another CD binder. You can connect your Mac or PC with a single, standard, included USB cable. If you’ve never worked with software before, you’re in luck because MIXDECK comes with special Traktor Numark Edition integrated software. You don’t need to do any mapping or complicated setup with this app because we worked directly with software developer Native Instruments to create this special version specifically to work out of the box with MIXDECK. If you’re more experienced with software, MIXDECK is compatible and mappable for virtually all DJ software – both MIDI and timecode. But MIXDECK isn’t just about playing tracks – it’s also about performing. This powerful system contains a full-featured mixer, great-sounding beat-synced effects, and a full range of pitch and looping controls. Get the rest of the scoop by visiting our MIXDECK page. 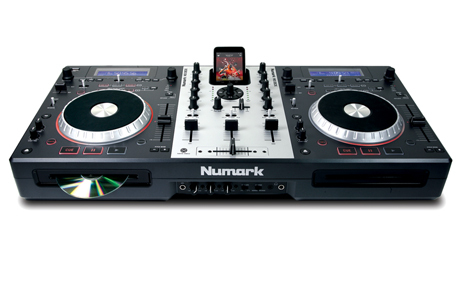 Call your Numark retailer and set up a test drive with a MIXDECK today.